If you've ever admired those pretty trays in Home decor stores, or even the thrift store, but thought you were not really a breakfast in bed kinda person, then here are five ways to use trays, that have nothing to do with breakfast! They're a beautiful way to 'frame' a vignette of candles and flowers, as you see above. 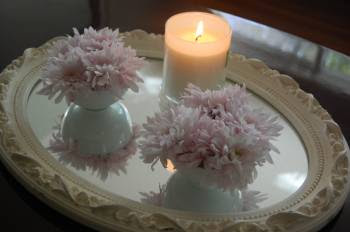 This tray is actually a mirror, repurposed as a platter for my Chrysanthemums and candles. I love how they reflect prettily and that the ornate edge of the mirror acts as a way to draw your attention to the arrangement. It wouldn't be nearly as pretty without the tray! I have a lovely Roccoco style ceramic platter with side handles that is more of a tray too. 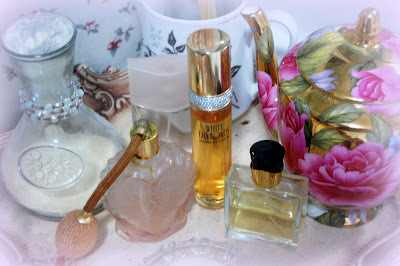 It displays my feminine accoutrements in the bathroom. If you're wondering about the teapot in the bathroom, I use it to water my ferns...isn't it gorgeous? 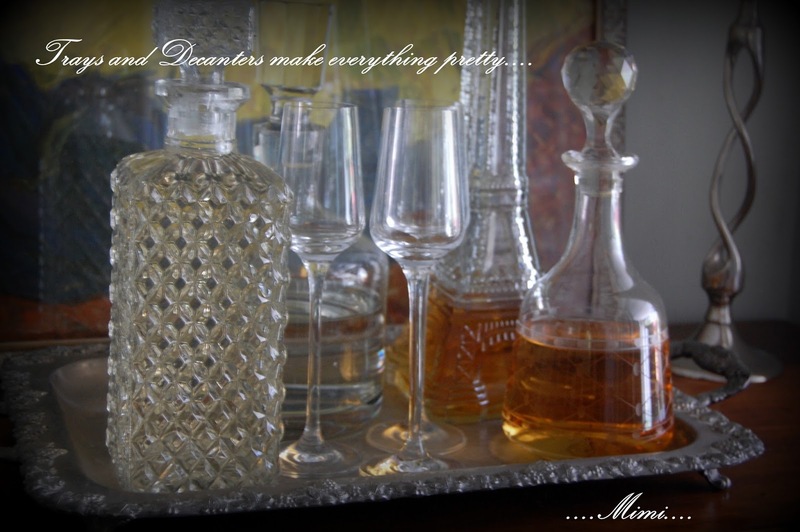 This vintage silver tray with sweet little feel, holds a group of vintage decanters. The contents of the decanters are used in cooking! I particularly adore the Eiffel Tower one...a special souvenir. I think the brandy inside was really awful but it did nicely for the Christmas cake...lol! This one with it's little ornamental handles acts as a holder for glasses and placecards for the Dining Room. This makes all the pretties for my dinner setting, easy to pick up and carry to the table. I bought this one for it's unusual decoration. 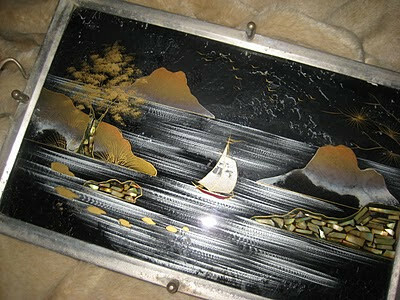 It's all inlaid mother of pearl shell and hand painted. It's quite unusual and eyecatching, and this photo doesn't really do it justice. I have it on my bedroom desk, just as a thing of beauty to admire. I found it in a thrift store, at the bottom of a pile of very ordinary stainless steel platters, so I tell you, it's good to dig around in those places! It was a whole .50c! How alluring, to imagine sailing past the hills glowing with pearly colour, and off into the stormy twilight on that little sailboat. Who can conceive what mer-creatures and treasures may be lurking in the shallow waters edge. And again...photos do not do this sweet tray, justice. It's a pretty lakeside grazing scene. The lambs are all glittered, as are the birds and the blue mountains. It's quite unique and another thrift store find for .20c. 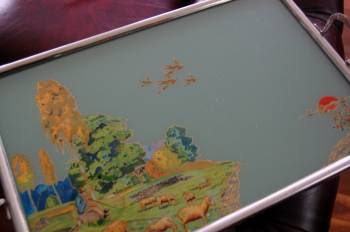 This one is simply use as a tray upon which a boiled egg and toast soldiers are served for sick loved ones. Have a beautiful, blissful day. Mim's you are indeed blessed~! I hope that you share many blissful moments with your darling daughter and your trays of bliss! Oh, that tray is just gorgeous! And what a lovely idea Mimi! Can't wait to see what tray you will come up with next! It makes me think - in our cupboards / display cabinets we have the "good items" on display. The Royal Doulton cups and saucers, Wedgewood, Royal Albert etc. Why is it gathering dust and not being used?!?! I think that I will start a tradition with my own Dear Mum. 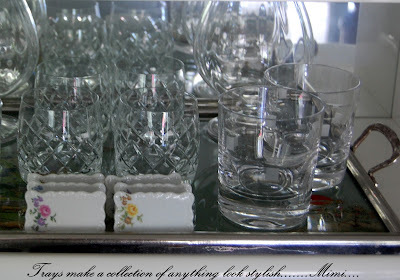 Invite her over for morning tea, and get out the good china from the display cabinet! A mini chandelier...just till I get a real one!